We came home today to find this mess in our bathroom. Although Oscar and Stewie pointed paws at each other... we are pretty sure this is Stewie's handiwork. It was only a matter of time. At least your had your toilet paper on the right way. If you put it on the other way, one day you will find your entire house full of it. he he our kitty does this too! Except she pulls the whole roll onto the floor and then rolls around in a happy state in a nice soft pile of toilet paper! We caught her once with a whole roll of toilet paper in her small little mouth walking without a care in the world all around the house. Very strange cat! I have two Siamese that used to do the same thing when they were kittens. Except when they got the paper off the roll they would shred it into little pieces of confetti and scatter it all over the house. 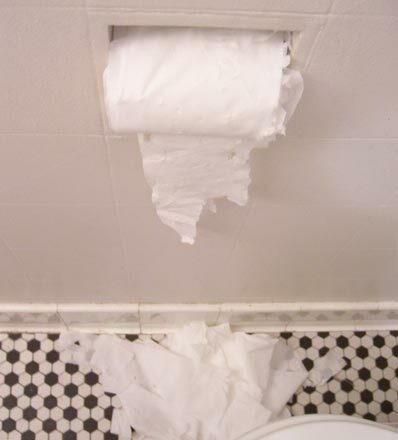 I have to store the toilet paper where my cat can't get to it. Otherwise I will come home and it will look like it snowed. You know Molasses had the same issue for a while. He'd steal the tp and shred it to bit in secret places. I resorted to a shoebox by the toilet, J hung some on the hook behind the door. That and knocking the trash can over, pulling the trash all over the kitchen, then peeing all over the trash. Fortunately, he has neither of those behaviors anymore. In our house, we've had to resort to putting the toilet paper completely out of reach. No matter how we hang it, it still gets eaten. Too cute!